Reports coming in from countries all over the world regarding injuries related to trampolines are somewhat very grim. The figures vary from 2 to 8 accidents in a single day, which makes this product one of the most dangerous “toys” on the market. According to experts, though, more than 90% of these injuries could have been avoided if only a minimum of safety requirements were met before and during the use of trampolines. As such, this observation by the experts changes the perception that using one will automatically spell doom for the users. It should be noted that there are also countless people who have jumped on trampolines for years without getting anything other than a good workout and lung-bursting laughter in return. A thorough and painstaking enforcing of this checklist can make the difference between rollicking times and trips to the emergency room. With the help of this safety checklist, people, especially children, will be able to have fun while jumping on a trampoline. A 3-meter wide perimeter is the recommended set up by experts. This will keep the trampoline away from structures and things that may cause injury to the jumper such as poles, trees, fences, and other furniture. The location has to be on even ground to prevent the trampoline from tilting to one side. Finally, the trampoline must be vertically clear as well. The jumper should not be in danger of hitting branches or electrical wires. A huge of number of springs and bolts is used in order to make the trampoline work. The combination of springs and bolts deliver the right tension needed by everyone who wants to jump on it. These have to be regularly checked to ensure that the springs are securely attached and that the bolts are tightened well. Signs of wear have to be monitored as well before every use. These two are very important features in keeping the players safe. Use nets to keep the action inside and to prevent people from jumping out of the trampoline. The padding is needed to take the impact if and when the jumper collides with any of the frames. There must be nothing under the trampoline at all times. Any object finding its way in this area may cause harm to the jumpers. The net that is used to keep users from falling off must not reach the ground and cover the line of vision towards the area below the trampoline. This will make sure that everyone can see that there is nothing in this area that may become a potential hazard. A good number of trampoline-related injuries come from seemingly the seemingly harmless jewelry on a jumper’s body. As the trampoline may cause the user to land on certain positions, a hard object can cause serious injury. Parents must also make it a point to remove anything inside the pockets of children. They may be brining something extremely hard or sharp. Regardless of what is popularly common on social media sites, somersaulting and other acrobatic moves should be strictly prohibited. The most serious injuries related to trampolines happen when these are attempted. There is a very real risk of getting head and neck injuries when the wrong somersault is made or when someone lands awkwardly. Fractures in different parts of the body are also common when an acrobatic move goes wrong. A trampoline should only hold one jumper at a time. Kids may use the trampoline simultaneously when they are all sitting down and just playing. When the jumping starts, everyone has to take their turn. It is very easy to collide and hurt someone when there are more bodies around. A singular user at a time also keeps the weight below the maximum load capacity. It is very clear that parents or guardians must always be around to supervise their children while using the trampoline. Kids have a way of finding trouble in so many ways in the blink of an eye. They can be very spirited in their jumping and may try moves that will scare even the experts. 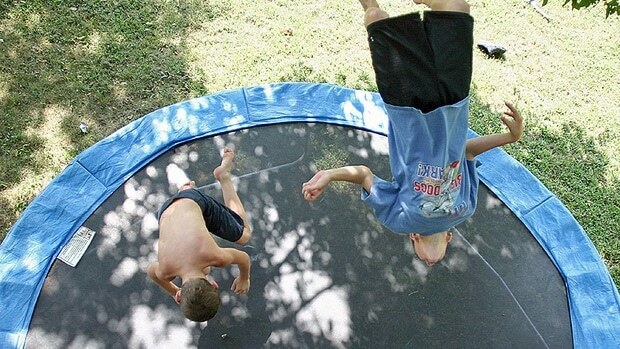 Children below 6 years old should not be allowed to use a standard trampoline. There are trampolines built for kids below 6 years old that are specifically designed for their needs. A full-sized trampoline will cause potential harm as these kids do not have full control of their movements yet. There are still other items on the checklist that have to be followed. However, ensuring that the mentioned things are followed, people should be able to avoid the common injuries related to trampoline jumping. As long as the checklist is ticked off, people can have a really good time without any added risk.